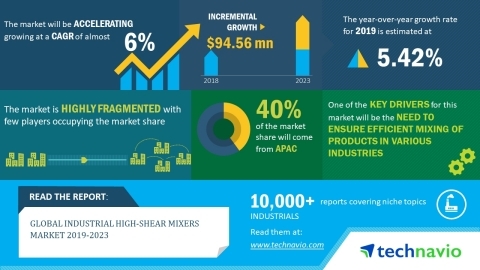 Technavio has announced the release of their research report on the global industrial high-shear mixers market for the forecast period 2019-2023. This industrial high-shear mixers market analysis report segments the market by product (industrial batch high-shear mixers, industrial inline high-shear mixers, and industrial multistage high-shear mixers) and geography (APAC, Europe, MEA, South America, and North America). Global industrial high-shear mixers market size will grow by almost USD 94.56 million during 2019-2023, at a CAGR of nearly 6%. The increasing demand for effective mixing in processing industries has resulted in several vendors launching new models of industrial high-shear mixers. These models are integrated with technological developments to provide added benefits to the end-users. Also, the uniform mixing capability of industrial high-shear mixers helps in decreasing batch-to-batch inconsistencies in processing plants. The increased focus of vendors on expanding their product portfolio of industrial high-shear mixers is expected to boost the growth of the market during the forecast period. The industrial high-shear mixers are used to blend, dissolve, deagglomerate, disperse, and emulsify various types of materials in the chemical industry. Industrial high-shear mixers are used for high intensity mixing to disperse ceramics and deagglomerate powders into primary particles for uniform end-products in chemical processing plants. Proper mixing is critical to achieving the desired physical properties in the final molded product in the polymer industry. The rapid mixing action of industrial high-shear mixers assists in decreasing the process time and mixing time when compared with conventional agitators and mixers. “APAC and North America will be the fast-growing geographies during the forecast period, whereas the market growth in Europe, South America, and MEA will be slow. Government initiatives focusing on industrial and economic growth will likely lead to an accelerated growth momentum of industrial processing equipment such as industrial high-shear mixers in APAC. The market in North America will exhibit an accelerated growth momentum due to end-users focusing on expanding their processing capacity. China, India, and Japan are some of the countries which will witness a high adoption of industrial high-shear mixers. This is owing to government initiatives that are focusing on industrial development,” says an analyst at Technavio. Industrial high-shear mixers are increasingly being used in processing gummy food products as they yield the best results.